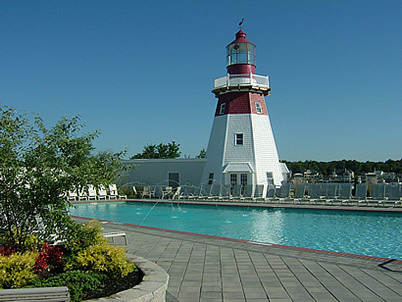 Lighthouse Point Marina and Yacht Club is New Jersey's most unique and hospitable marina. Our major renovation project makes us one of the finest marinas at the Jersey Shore. The marina offers over 248 deep water slips on 14 acres with accommodations to 75 feet and 38 jet ski docks. We have a secluded, premier location on the scenic Toms River in Ocean County with open water access to the expansive and protected Barnegat Bay and ocean access from either the Manasqan or Barnegat inlets. Lighthouse Point Marina features a working replica of a Cape Cod lighthouse. You can beat the summer heat in our gated and secure Olympic size swimming pool. Around the pool we have plenty of tables and chairs with umbrellas and comfortable lounge chairs for your use. Enjoy our private poolside bar with weekend entertainment. We also offer a game room and planned weekend and holiday activities for adults and children. We provide full service boat brokerage, winter storage, marine repair and winterization. 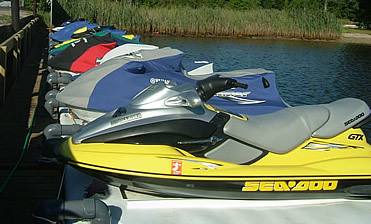 Let the fun begin right away with our jet ski docks, no more hassles towing your jet ski to the water. We are staffed year round with trained and experienced personnel. 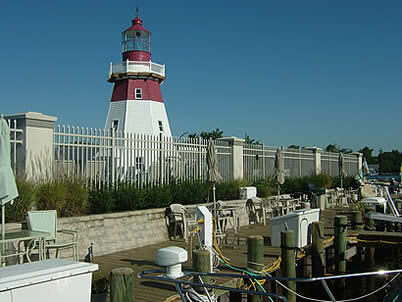 Lighthouse Point Marina is centrally located for ocean access to either the Manasquan or Barnegat inlets. Our marina basins are extremely calm and protected with no wakes. Since the marina is not surrounded by marshes, there are virtually no pesky mosquitoes or biting flies to interrupt a day spent lounging on your boat or picnicking on the dock. We offer new, vinyl bulkheaded slips, complete with state of the art power pedestals. Our pedestals feature 30, 50, or 100 amp service with independent breakers, telephone, CAT-5 cable and water service. Our boat lift is a 35 ton BFM II Marine Travelfit mobile boat hoist with wireless remote control. 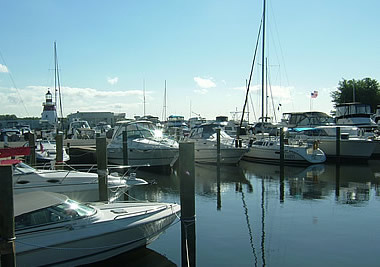 Lighthouse Point Marina is within walking distance of historic downtown Toms River; restaurants and an ice cream shop. For a list of upcoming events in Toms River's downtown district and Huddy Park visit www.downtowntomsriver.com*. * Lighthouse Point Marina is neither affiliated with the authors of this page nor responsible for its content.